Keepalived is used for IP failover between two servers. It facilities for load balancing and high-availability to Linux-based infrastructures. It works on VRRP ( Virtual Router Redundancy Protocol ) protocol. We have running two load balance servers using HAProxy and now we need to implement VRRP between both servers. This tutorial will help you to configure KeepAlived, Use this tutorial to configure HAProxy on both servers. 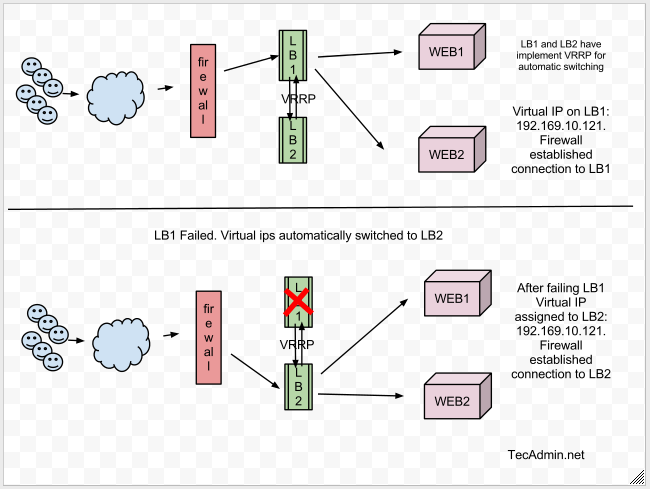 Now we are implementing ip failover setup between LB1 and LB2 servers. Use the following command to install required packages to configure Keepalived on the server. Keepalived is available in centos base repository. Install it using yum command line tool. Edit Keepalived configuration file on LB1 and add following configuration. Update all red highlighted values with your network and system configuration. Edit Keepalived configuration file on LB2 and add following configuration. While making changes in LB2 configuration file, make sure to set priority values to lower than LB1. For example below configuration is showing 100 priority value than LB1 has it 101. 1. Priority value will be higher on Master server, It doesn’t matter what you used in state. If your state is MASTER but your priority is lower than the router with BACKUP, you will lose the MASTER state. 2. virtual_router_id should be same on both LB1 and LB2 servers. Start KeepAlived service using the following command and also configure to autostart on system boot. By default virtual IP will be assigned to master server, In case of master gets down, it will automatically assign to the slave server. Use the following command to show assigned virtual IP on the interface. Follow the below process to test keepalived failover is working correctly. Shutdown master server ( LB1 ) and check if ips are automatically assigned to the slave server. Now start LB1 and stop slave server ( LB2 ). IPs will automatically be assigned to master server. Mar 19 17:30:25 localhost Keepalived_vrrp: VRRP_Instance(VI_1) setting protocol VIPs. Mar 19 17:30:25 localhost avahi-daemon: Registering new address record for 192.168.10.121 on eth1.IPv4. I hope this article will help to setup IP failover between two load balance servers. Why install gcc + kernel headers/devel ? Thank you very much for this tutorial. I am a beginner and I found it really easy to follow. Cheers! vrrp_script is a script which will be running every 2 s (interval 2), so i dont think that you want that every 2s “killall -0 haproxy” will be executed. Thus i think you should run a command that check the state of your proxy like ps or a special command of your proxy. Anyway, i think that the fail over happens because if the secondary server is the first which runs keepalived, he will runs “killall -0 haproxy”, and increment the priority by 2 (weight 2), so the priority becomes 102 > 101 (the priority of the and increment the priority by 2 (weight 2)primary server) => FAILOVER, after that as the same way, the primary server runs “killall -0 haproxy” and increment the priority by 2 (weight 2), so the priority becomes 103 > 102 => FAILOVER …. Pretty much same config is on the other HAProxy server with exception to the router_id and priority (100). Dec 9 06:25:02 localhost tripwire: Integrity Check Failed: File could not be opened. Dec 9 06:25:03 localhost tripwire: Integrity Check Failed: File could not be opened. Dec 9 12:25:07 localhost Keepalived_vrrp: VRRP_Instance(243) setting protocol VIPs. Dec 9 12:25:09 localhost Keepalived_vrrp: VRRP_Instance(243) removing protocol VIPs. Any help around this would be appreciated. IP owner case is not working in keepalive and dont know where to use primary ip address ? can anyone see config file and below explanation and let me know is it correct config for owner case or what ???? In this file there is no field to specifically save the primary address & all configured addresses goes to the VIP list block. Can you please let me know where i can use primary ip address will be configured in above configuration file. Host A – Interface IP “30.30.30.1” (Lower), priority “150” (same), vrrp instance “1” (same). Host B – Interface IP “30.30.30.2” (Higher), priority “150” (same), vrrp instance “1” (same). Description – Currently we have Host B as “Master” and Host A as “Backup” because Host B’s Interface IP is higher than Host A and their priorities are same. We add two entries in the VIP (virtual IP address) block in “Keepalived.conf” file of both the hosts i.e. 30.30.30.3 & 30.30.30.1 (Host A interface IP). As per the config if we reload keepalived on both the hosts, Host A interface should become the master as this will be our IP address Owner case. But this does not happens. Expected behavior – Host A Interface should become Master as Interface IP address is same as primary IP (IP address owner case). Current behavior – Host B interface acts as Master. Host A state is fluctuating between Master & Backup and its Not consistent. Secondly when we stop the KA on host A in this scenario it removes the Virtual IP address from the interfaces, since in this case we have added the real interface IP address here thus that IP address is also removed (from the actual interface). This will result in even bad state for a system. Step 3: Configure Keepalived on LB1. Add below configuration in keepalived configuration file on LB1. Step 4: Configure Keepalived on LB2. Add below configuration in keepalived configuration file on LB2. look lb2 ,state MASTER change state backup?